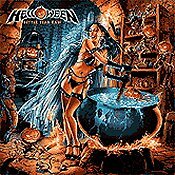 Born as one of the most seminal of German speed metal bands, HELLOWEEN soon diverted drastically from their musical roots and morphed into the best speed- prog band the planet has ever heard. I remember when the band first departed from their "Walls of Jericho" sound I felt betrayed but it didn't take very many listens to albums like the "Keeper of the Seven Keys" (both parts) to realize that although I was, in a sense, losing one of my favorite thrash bands I was gaining an overall far superior HELLOWEEN. Over the past decade the band has ridden a roller coaster of support in the United States as labels who didn't understand them offered inconsistent American distribution and marketing - inconsistent and in some cases non-existent, that is. I hope things will be different this time around because HELLOWEEN has put together something special here. In fact, I would have to concur with the vast majority of pundits (geez, I hate doing that) in declaring this the best HELLOWEEN album since the aforementioned "Seven Keys" opuses. Lightening metal played seamlessly and impregnated with more melodic structure in the course of one tune than many progressive bands manage in entire albums. HELLOWEEN are perched on the pinnacle of greatness once again and "Better Than Raw" is their declaration of war. The kings of power metal have returned to their rightful place atop the masses of lesser bands with lesser talent and lesser vision.